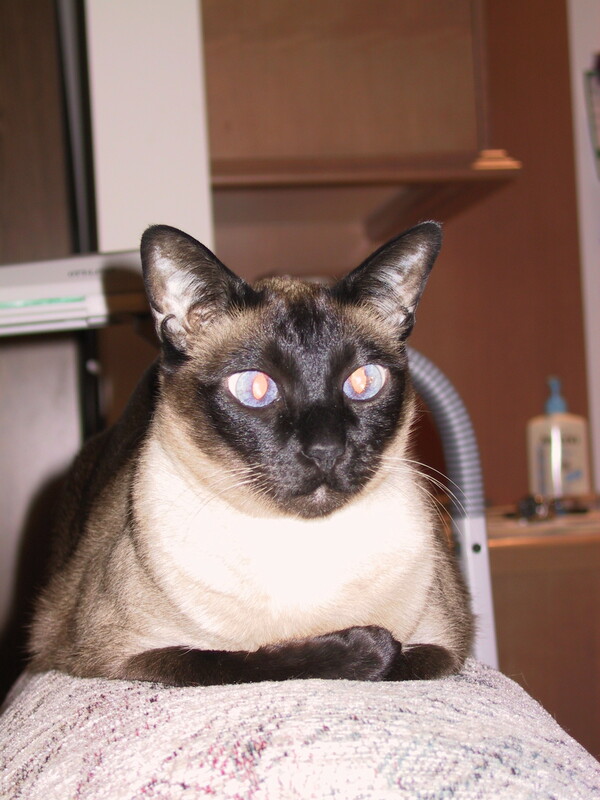 I’ve written before about how much I loved my Siamese cats and how I missed them as each one passed away. With the dogs, I don’t plan on getting another cat. Actually, after the dogs, I might just go without pets for a while altogether. But before the cat, came the kitten. Here is Siamese #1, shortly after we brought him home. You can’t tell he’s going to be a beautiful boy when he grows up, but you could tell he would be an imp. We put him down in the kitchen and he promptly started rolling the potato all over the floor. Look at the size of those claws – they were huge for such a tiny guy. The movie, Dances With Wolves, was a big deal at the time so the kitten’s first name was “Rides Potato Like the Wind”, followed by “Pees on Plastic”. That unfortunately happened because while we were having fun watching him play with the potato, we also forgot that tiny kittens have tiny bladders and they eventually have. . . needs. He was so little – only six weeks old. We didn’t get kitten #3 until he was 12 weeks old and those six weeks made a huge difference in how aware they are. Kitten #1 missed his momma, his littermates, and being taken care of. He eventually got it, but it took a while before he figured out that he could eat without being told to and use the litter pan without being taken there. His favorite trick was to climb our pant legs when he wanted attention. Thankfully he got too big for that pretty quickly. Word for tomorrow – INSECT. If you prefer to work ahead, see the list for the week under “A Word A Day”. I think little kitten #1 showed promise of the beautiful boy he became — but of course that is easy for me to say with the two photos side by side. He was such a little fuzzball when he got him! He was the first Siamese and I couldn’t envision how he’d grow up to be such a gorgeous cat. He was too fuzzy and his points just too smudgy. But he did grow up into a beautiful boy. He had the greatest personality too – I loved him so much. I really miss him, but I did have him for nearly 15 years. They’re beautiful! Siamese cats are the best. Thanks for stopping by to visit my blog and leave a comment. He was a beautiful boy and I agree, Siamese are the best. I’m glad to find other fans!